By Laura Larkin | September 23, 2014. Fatima residents are bringing community gardening into the future with a new space age ‘grow dome’. The impressive 90sq foot structure is capable of producing 1000 lettuce heads a week for locals. 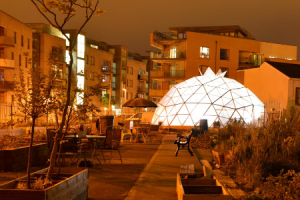 With high-tech gardening methods the geodesic dome can be used all year round with very little labour required. Lord Mayor Christy Burke officially opened the grow dome last Saturday and the Dublin 8 garden showed off its prowess as a night-time venue too. What started as a community garden on a wasteland plot can now also be used as a venue for local musicians and theatre events. “We are planning a play on top of the growing area. The spiral in the centre of the dome can be used as a stage,” one of the dome’s co-founders, Niall O’Brien explained. “You can have a full audience at night when the plants are asleep,” he added. The initial trial will see the gardeners producing just lettuce which they will pass on to the F2 community centre for its café and cookery classes. According to the green-fingered Fatima resident “you can grow pretty much anything”. It harvests rainwater and is essentially self-sustaining he explained. “The bulk of the work is in the planting and harvesting so we’ll work that out with trial and error,” Mr O’Brien noted. Primary schools in the area are hoping that they will be able to use the dome as a venue for future gardening classes. The dome is heated by wood stoves in the winter months and solar panels for the remainder of the year. Fatima Mansions is the first Dublin community to spearhead this futuristic gardening approach but its founders hope that it will spread city-wide; creating community employment. “We have already had interest from other areas, everyone who sees it wants one. We hope that it is the first of many around Dublin city,” said Mr O’Brien. The pilot scheme, which cost around €5000 to set up, looks set to become a centre point for the community.